Typically 1D arterial networks are made up of a connection of different base units: segments, bifurcations and merging junctions. The input format in the PulseWaveSolver means these connections are handle naturally from the mesh topology; hence care must be taken when designing the 1D domain. The figure below outlines the structure of a bifurcation, which is a common reoccurring structure in the vasculature. Figure 12.1: Model of bifurcating artery. 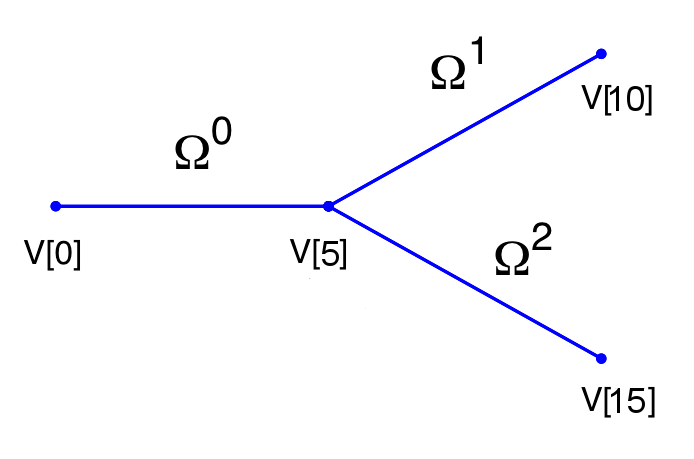 The bifurcation is made of three domains and 15 vertices. Vertex V is the inlet and vertices V and V the outlets. We will use the different domains later to define variable material properties and cross-sectional areas. The following parameters can be specified in the PARAMETERS section of the session file. In this section we can specify the boundary conditions for our problem. First we need to define the variables under the section VARIABLES. Finally we can specify the boundary conditions on the regions specified under BOUNDARYREGIONS. The Pulse Wave Solver comes with a number of boundary conditions that are unique to this solver. Boundary conditions must be provided for both the area and velocity at the inlets and outlets of the domain. Examples of the different boundary conditions will be provided in the following. MaterialProperties: specifies the material properties for each domain. A_0: Initial area of each domain. The values of beta are used in the pressure-area relationship (equation 12.2).